Bang & Olufsen has detailed its latest lifestyle TV model. The new Beovision Harmony pairs an LG 4K OLED display with B&O's unique design and audio elements. "Pristine picture performance combined with truly immersive sound ensures a mesmerizing viewing experience. But the presence of a big screen is rarely a welcoming addition to living spaces. With Beovision Harmony, we wanted to create a meaningful object for interior that reduces the visual presence of the TV and transforms it into something that people will develop an emotional attachment to", says John Mollanger, Bang & Olufsen’s Executive Vice President of Brand and Markets. When not in use as a TV, the Beovision Harmony's screen is positioned close to the floor with two oak and aluminium front speaker panels raised up in a vertical alignment to partially cover the display. Then, when the TV is turned on, the fronts are lowered to a horizontal configuration like a butterfly opening its wings, allowing the screen to rise up to an ideal viewing height. For its display, the system features a new LG 77-inch 4K OLED panel. Meanwhile, the "butterfly wing" panels house the unit's audio components, specially tuned to provide three-channel, fully active DSP-based sound. When it comes to music streaming, the device includes integrated support for services like Tune-In and Deezer, along with the ability to play content from a smartphone via Apple Airplay 2, Chromecast built-in, or Bluetooth. Likewise, the display is equipped LG's webOS 4.5 smart TV platform, offering access to variety of media services like Netflix, Amazon, and YouTube. Finally, the Beovision Harmony also includes a built-in 7.1 surround sound decoder, enabling users to connect up to eight Beolab speakers to create a full surround sound system. "We have been sharing an obsessive passion for almost 100 years, and it has been a mission of ours to perfect the techniques used to reproduce sound and vision and to embody it in a design that people are proud to have in their homes. Wood has always been an important aspect of Nordic architecture and furniture design because of its individual character, robustness and versatility, and we are proud to carry this forward in our Beovision Harmony", says John Mollanger. 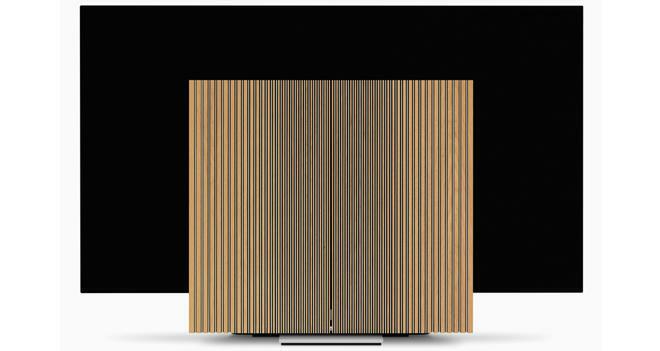 Bang & Olufsen's new Beovision Harmony will be on display at Milan Design Week from April 9 to 14. The system is set to launch in October 2019 for an estimated retail price of 18,500 EUR. Units will be available with a combined oak wood/aluminium front or a combined Grey Melange two-tone fabric/aluminium front.